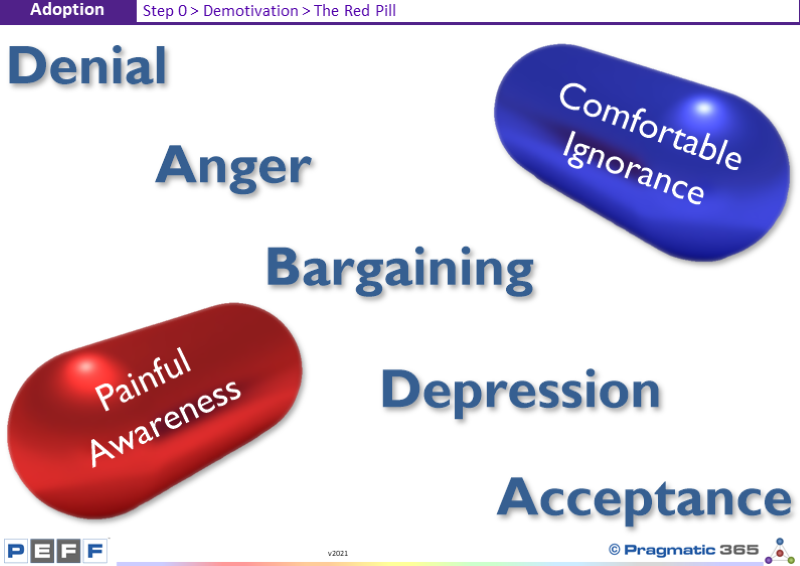 Most people are familiar with the concept of a Blue and Red pill from the film The Matrix. "You take the Blue pill, the story ends. You wake up in your bed and believe whatever you want to believe. You take the Red pill, you stay in Wonderland, and I show you how deep the rabbit hole goes." What is being offered is a choice to stay in a world of comfortable ignorance or take a step into a new world of painful awareness. But taking the red pill is not an easy choice. It is after all a step into the unknown. Into something we can’t yet see. Our primitive brains are hardwired to fear what we cannot see or understand. To be wary, to ignore, to reject, to dismiss. Perhaps, for people to accept a new reality or a new idea, people should go through various stages. The Kübler-Ross model (otherwise known as the five stages of grief) postulates a series of emotions experienced by terminally ill patients prior to death, or people who have lost a loved one, wherein the five stages are denial, anger, bargaining, depression and acceptance. ¨ Denial – The first reaction is denial. In this stage individuals believe the diagnosis is somehow mistaken, and cling to a false, preferable reality. ¨ Anger – When the individual recognizes that denial cannot continue, they become frustrated, especially at proximate individuals. Certain psychological responses of a person undergoing this phase would be: "Why me? It's not fair! "; "How can this happen to me? "; "Who is to blame? "; "Why would this happen?". ¨ Bargaining – The third stage involves the hope that the individual can avoid a cause of grief. Usually, the negotiation for an extended life is made in exchange for a reformed lifestyle. People facing less serious trauma can bargain or seek compromise. For instance: "I'd give anything to have him back." Or: "If only he'd come back to life, I'd promise to be a better person!" ¨ Depression – "I'm so sad, why bother with anything? "; "I'm going to die soon, so what's the point? "; "I miss my loved one, why go on?" During the fourth stage, the individual despairs at the recognition of their mortality. In this state, the individual may become silent, refuse visitors and spend much of the time mournful and sullen. ¨ Acceptance – "It's going to be okay. "; "I can't fight it; I may as well prepare for it." In this last stage, individuals embrace mortality or inevitable future, or that of a loved one, or other tragic event. People dying may precede the survivors in this state, which typically comes with a calm, retrospective view for the individual, and a stable condition of emotions. That same model can be also applied to how people deal with new ideas that go against what they believe they already know. ¨ Depression – "OMG, I’m actually going to have to do something about this!" Are the leaders of your Enterprise ready to take the red pill?